The Pencil Grip | My Journeys Through Life . . . Herding Cats In New Mexico! My boys have very happily been using Magic Stix Washable Markers for a while now, and were just about grabbing this set of markers before I even managed to finish getting it out of the shipping box! The Pencil Grip, Inc. was so generous that they gifted us, for the purpose of this review the 24 pack of Magic Stix Washable markers. We have been blessed to review for this company in the past, and you can read those reviews (of various products) here. This time around, my two main artists used the Magic Stix Washable Markers. “The Artist” has really been into drawing fantastic creatures. He also drew this fun picture of a family of fruit characters . . .
And a lovely picture of our dog, Shiloh! “Mr. Loquacious” has been very interested in making drawings of flags for a long time, having been working on a notebook full of USA state flags, each with pertinent facts, for a long time. But then, the Olympics started, and he wanted to do flags from the countries participating! Here we have the flag of Albania . . . The flag of Argentina . . .
And the flag of Antigua and Barbuda . . . Here are some of the other flags he has done . . .
As you can see from the drawings, the colors here are wonderful! Magic Stix come in a very nice heavy-duty plastic case, which is easily opened and closed. I especially appreciate this, because I always know where these markers are when they are not being used. This is because even my most lackadaisical kids enjoy seeing to it that the markers are back in the kit, and closed up tight. Because of this, I think this would be a perfect fun thing to pack when going on a trip. Include a tablet of heavy paper, and you will be good to go! For educational purposes on the trip, the kids can journal (in pictures) interesting things done and seen while traveling. Although I was afraid to test this, the Magic Stix Washable Markers are guaranteed that they can be left without a cap for seven days, and they won’t dry out! A number of other members or the Review Crew did test this, and wrote about it in their reviews, along with the guarantee that they are washable. The markers are also odor free (a plus, in my opinion!) and non-toxic. “The Puzzler” is using some of the Magic Stix Washable Markers in a review of another product, coming very soon. Maybe you will be able to spot them! 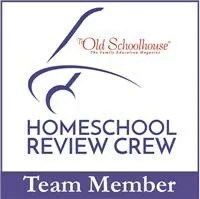 Please, click the banner below to read the fair and honest reviews from ninety-nine of my fellow crew members. You’ll read great reviews, and see lots of terrific artwork, too! New Place to Get Kwik Stix! My boys and I have just loved both the Kwik Stix and the Thin Stix from The Pencil Grip, Inc. company. When we reviewed them in the past, the boys had a blast! You can read about that here, and see just how much fun they are! Well, I have good news for you if you live near a BJ’s Wholesale Club! You may now purchase this wonderful product there, at the very good price of $19.99 for the 24 pack! This is a great deal! When I review a product, I often receive free product in exchange for an honest opinion expressed on this blog. I am not required to write a positive review, nor am I additionally compensated for these reviews. I share my opinions, and the opinions of my family, of these products. I am disclosing this in accordance with FTC regulations. Two of my boys have been playing around with a new addition to the Pencil Grip, Inc. company, which we were given for the purpose of this review. They have been creating art with this company’s new product, the Thin Stix 6pk of Classic Colors. 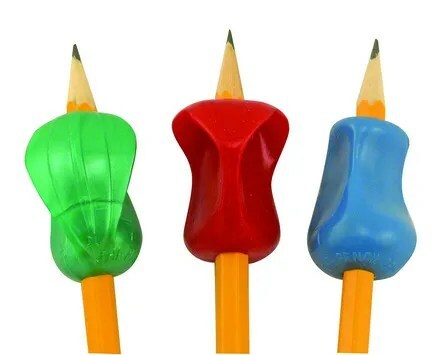 We had previously reviewed an earlier product from The Pencil Grip, Inc., and absolutely loved it, so when this opportunity came up, my boys really bugged me to apply for it! When we reviewed the original Kwik Stix, my son “Mr. 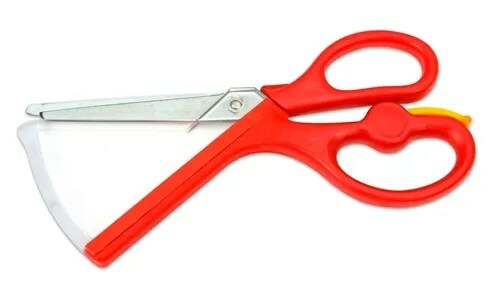 Loquacious” really enjoyed them, however, he had me say in the review that he wished the company would make them even thinner, so he could use them for more detail. Well, they did, and now we have Thin Stix! He is asking now though, if the company would please go even thinner, more like the thickness of a crayon. Not too demanding at all, this child of mine! Hey, the way *I* see it, at least this time around he was not hampered by a sling on his dominant arm, lol! 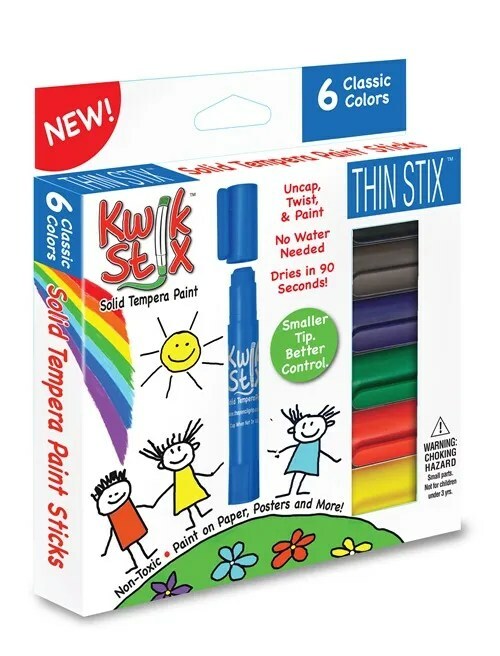 The Thin Stix 6pk of Classic Colors, like their thicker brothers, the Kwik Stix, are also actual Solid Tempera Paint, inside of a marker like container. My boys simply pop off the cap, roll up the paint as you would do with a glue stick, and paint their hearts out. After that, they roll it back down and put the cap back on, being sure to get it on tightly. It truly could not be simpler in any way! Thin Stix, exactly the same as their thicker brothers, really is paint, but the reason *I* like it is that I am just not one of those “cool” homeschooling moms who doesn’t mind messy projects. I don’t know what it is, but I am always afraid the mess will become permanent damage. Now, THIS paint is not like that at all! the pictures that “Mr. Loquacious” and “The Artist” are showing off above were painted on simple printer paper. First, the only one which had any curling was the flag that “Mr. Loquacious” made. Since the pictures that “The Artist” made are not heavy with paint, and did not cover the entire page, his did not curl at all. And they BOTH did indeed dry completely within 90 seconds, just exactly as the company claims the product will do. Gotta love that! My kids are really enjoying this product, and I think they will continue to do so! 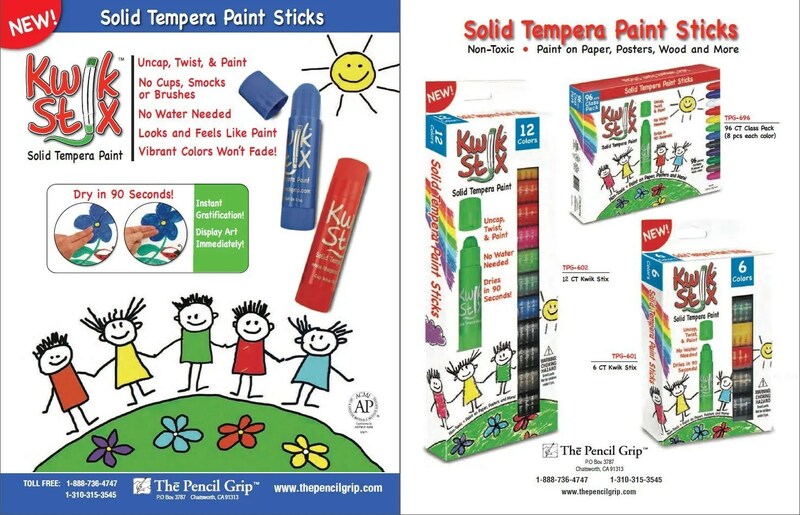 Solid Tempura Paint Sticks, from The Pencil Grip, Inc. This has been a very fun review for us! We have been using the Kwik Stix 12 Pack from The Pencil Grip, Inc. I am going to tell you right now, this is as far as I can remember during my time on the Review Crew, the very first time that when I opened a box with a review product in it straight from the mail, I had two kids quite literally attempting to pull it right out of my hands immediately, lol! It was too funny! I had to make them let go, just so that **I* could take a look at it! I’ll be honest, I had my doubts about the quick dry claims. And “Mr. Loquacious” used a pad of newsprint that I had purchased from a scrapbook store which was going out of business. By the way, it did not matter one bit whether or not I put down paper first, these Kwik Stix truly do dry super fast, and they did not bleed onto the back side of either kind of paper! How cool is that? As you may have noticed in the shipping package above, The Pencil Grip, Inc. also included a sample Kwik Stix, as well as a sample pencil grip. My eldest, “The Batman” is my one child who has the most difficulty with writing and printing, because of his disabilities. He asked me if HE could use it, and review it for me so I would know from him how well it works. “The Batman” is left handed like me, as you can see. Now, you can see in the picture how he needs to hold a writing utensil. The instructions for the pencil grip said to use it with the thumb on the letter L for left handed writers, and the thumb on the R for right handed writers. Unfortunately, “The Batman” had a lot of trouble using it with those instructions, however. He needed to reverse it, and put his left thumb on the letter R. It seems to work very well for him that way! We are VERY pleased with this product, and think you would be as well, but don’t take my word for it, go along over and read what the other Crew Review members had to say! Just click the banner below, and it will take you to all of the reviews!